sketch transferred to watercolor paper from sketchpad with graphite paper, adding some color to those pretty eyes. 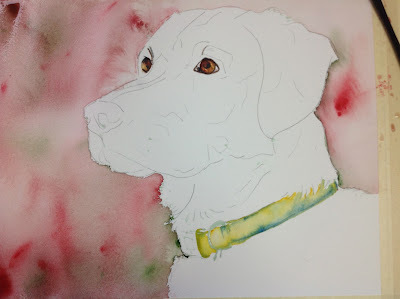 Thought it might be interesting to see some progress shots of a pet painting. I start with choosing the best photo. And begin sketching pencil on paper. And then use graphite paper to transfer the outline of the sketch to my painting paper. I don't usually begin with the eyes, but this time I did! I pick a basic color palette before I put paint on paper, but don't always stick strictly to it. I check in periodically with the owner to be sure I am on track and they don't have any changes. I often end with adding touches of white to eyes and fur to give some extra highlights. 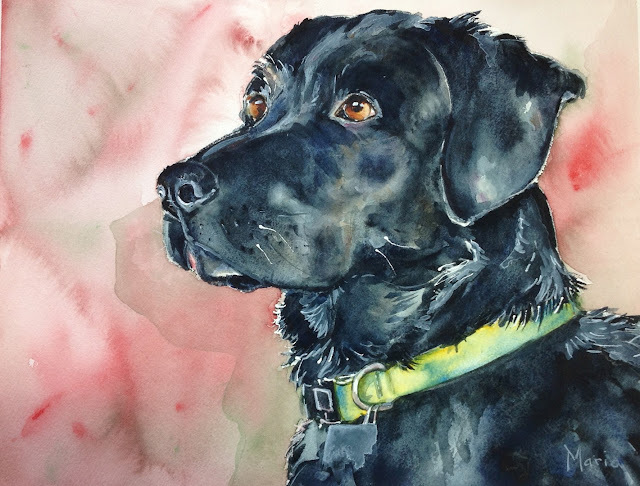 My mother commissioned this portrait of our sweet Lucy girl for my husband and I. When we opened your lovely wrapping and saw those eyes, we wept. You have captured our Lucy girl's soul in those eyes. You have such an amazing talent. Thank you for giving us such a wonderful way to remember her. 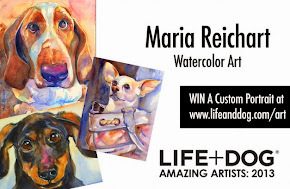 What a stunning painting, Maria. The lab is just gorgeous and I love the shadow on the wall behind her!! Thank you! I really enjoyed painting her. Black dogs are difficult in watercolour - but you've made it look easy and produced an outstanding piece! Bravo! Thank you Pat! Black dogs are so hard. I sometimes get too much blue in my darks. And I tend to not go dark enough, afraid to lose those highlighted areas. She is lovely, Maria. You have painted her with such a look of sweetness in her expression.